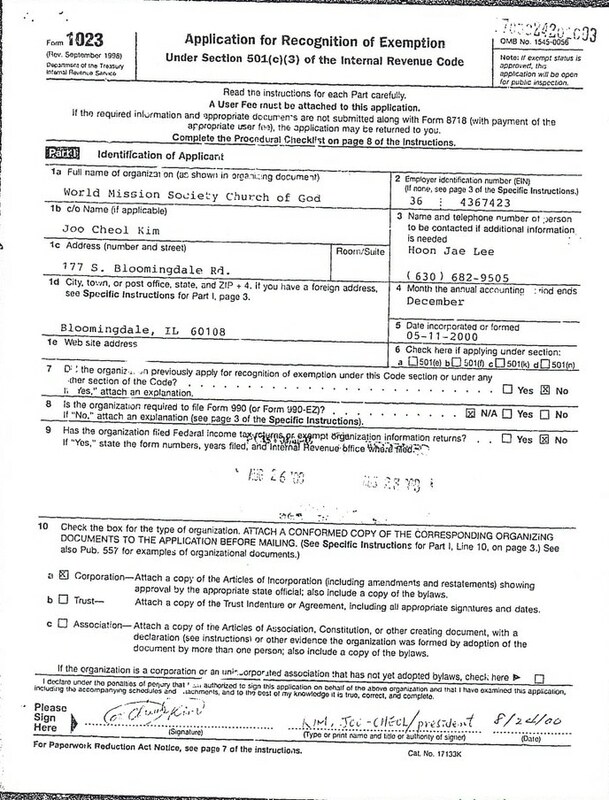 In 2000, the World Mission Society Church of God in Bloomingdale, IL submitted an application for tax exempt status to the IRS. Click here for more information on the application process and how to request your own copy of the application filed by the WMSCOG directly from the IRS. In a recent post, we examined the application the WMSCOG filed for their Los Angeles, California location in 1999. 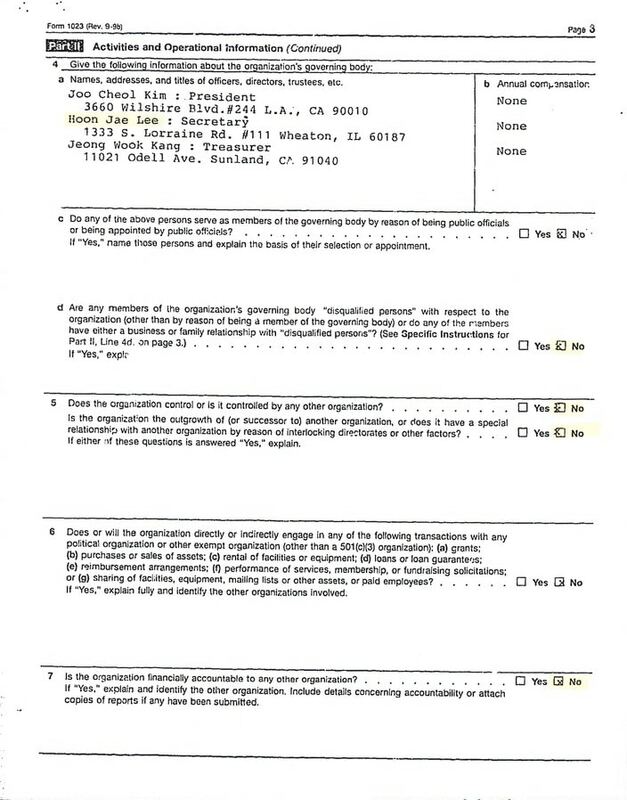 Now let’s take a look at the application for tax exempt status that the WMSCOG filed in Bloomingdale, IL a year later. 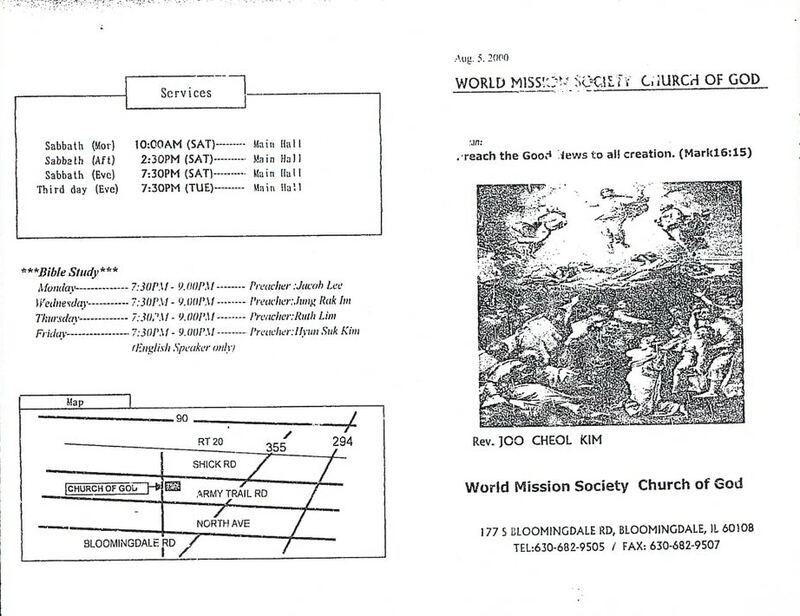 Page 2 (Part II) – The WMSCOG provides a description of the activities of the organization. In contrast to the application filed for Los Angeles, California, a worship schedule is included. In section A paragraph III, the application states, “After every Saturday morning service, the feast is prepared by the pastor”. What feast could they be referring to? The Sabbath is mentioned in addition to the feasts in verses like Nehemiah 10:33 and 1 Chronicles 23:31, therefore it remains unclear why the “feast” is prepared after the first service every Saturday. No Mention of Ahnsahnghong? What About ZhangGilJah? No mention of Ahnsahnghong or ZhangGilJah in the stated purpose of the WMSCOG Bible studies? According to the WMSCOG, without believing in Ahnsahnghong and ZhangGilJah there is no salvation. Why then are neither of them mentioned here? No Mention of the “Founding Father” Joo Cheol Kim? 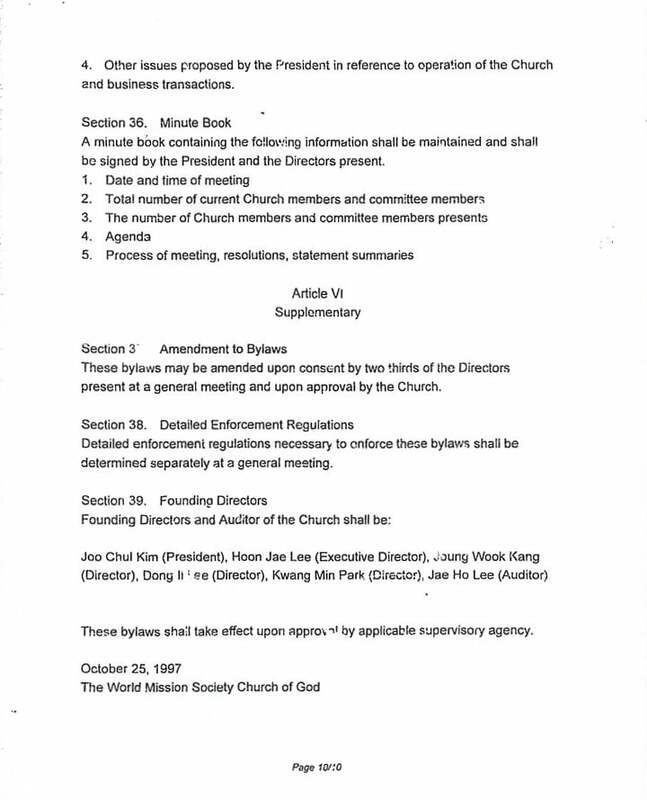 Page 3 (Question 4 & 5) – Note that WMSCOG general pastor Joo Cheol Kim is listed as the president of the organization (Question 4a). 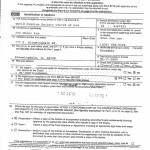 On the application for Los Angeles (Page 11 Schedule A), he was listed as the founding father of the WMSCOG. Yet in Question 5, when asked if the applicant is an outgrowth of another organization or if it has a special relationship with another organization by reason of interlocking directorates or other factors, the WMSCOG answers “No”. Why would the WMSCOG answer “No” to this question when Joo Cheol Kim is listed as the “founding father” of the Los Angeles location and the “president” of the Bloomingdale location? Is not the Bloomingdale location an outgrowth of the larger parent organization? 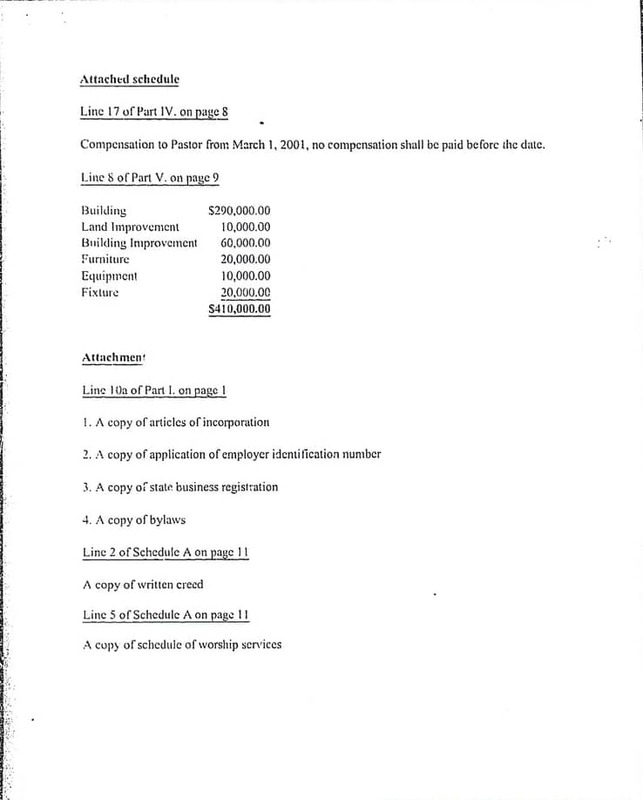 Page 8 (Part IV) – The WMSCOG documents $327,600 in revenue line 13 ($282,857 in excess over expenses line 24) between 7/1/2000 and 12/31/2000. Do any WMSCOG members know what the excess $282,857 was spent on? Why did they expect to collect less revenue than they collected in the first 6 months, in the next two years? 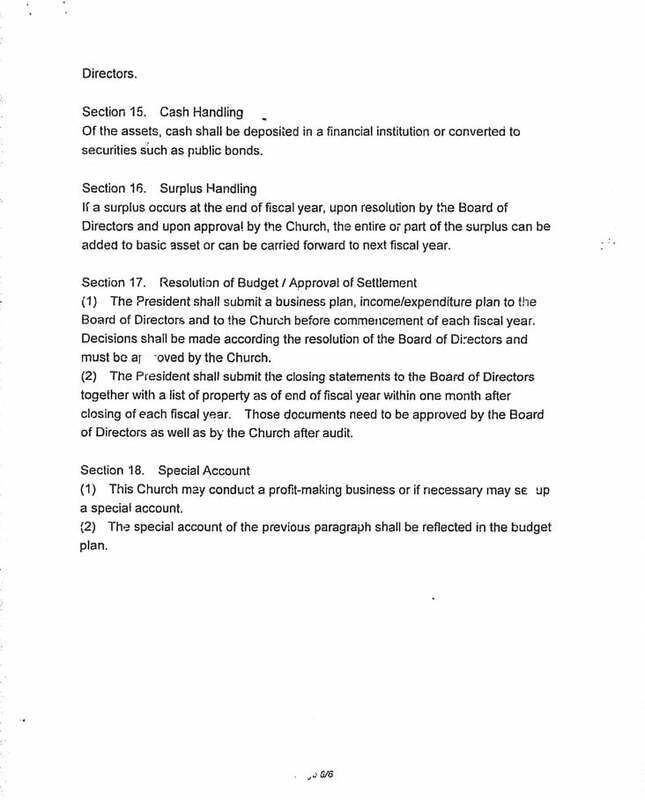 Note line 17 that describes compensation paid to officers, directors, and trustees. The WMSCOG budgeted to pay it’s employees $10,000 and $12,000 in 2001 and 2002 respectively. Yet many members have informed us of claims by the WMSCOG in this location that “no one gets paid”. Attached Schedule – The WMSCOG reiterates, “Compensation to pastor from March 1,2001, no compensation shall be paid before the date” [sic]. 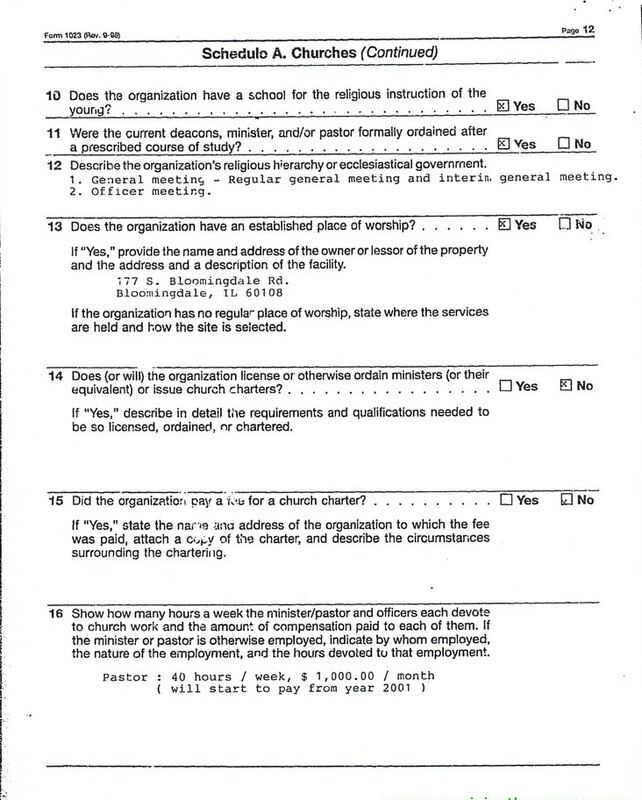 Why does the WMSCOG tell members that no one that works for the organization is paid a salary, and then budget to pay employees a salary on their application for tax exempt status? As in the application the WMSCOG filed for Los Angeles, there is no mention of Ahnsahnghong or ZhangGilJah. There is no mention of Joo Cheol Kim, the “founding father”, here either. Why would the WMSCOG give a different answer to the same question just a year later? 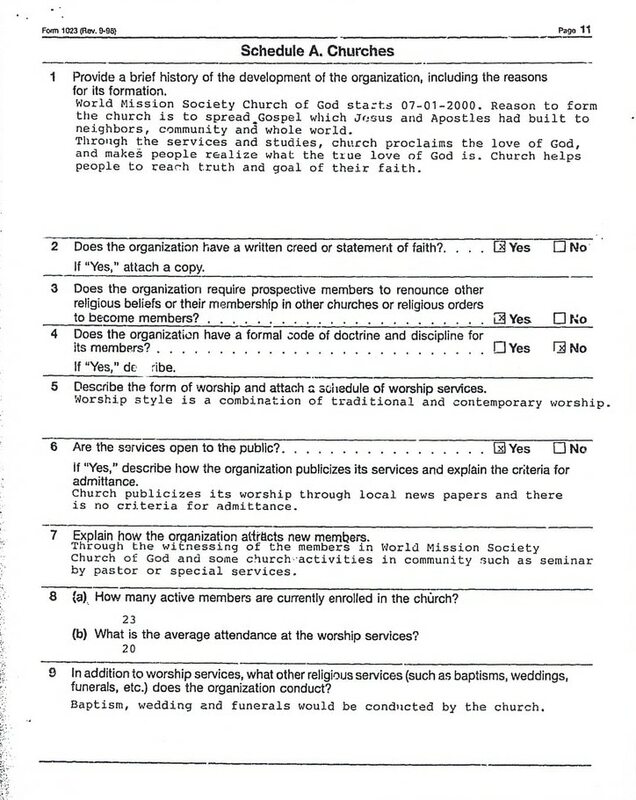 Could it be because they claimed not to have a relationship with any other organization on Page 3 Question 5? No Criteria For Admittance to the WMSCOG Worship Services? Can anyone provide proof of any such advertisement? No criteria for admittance? Former members have reported to us that the WMSCOG does not accept walk-ins off of the street into their buildings. WMSCOG members are assigned to security detail and can be observed guarding the the doors before and after services. Former members have also reported having seen the WMSCOG threaten to call police to have unwanted visitors escorted off of the property. The WMSCOG Continues to Claim to Conduct Funerals? As discussed during the analysis of the application for Los Angeles, the WMSCOG does not conduct, believe in, or allow their members to attend funerals. Why then would the WMSCOG list “funerals” as a service for a second time? Is this an attempt not to stand out among other churches filing for tax exempt status? 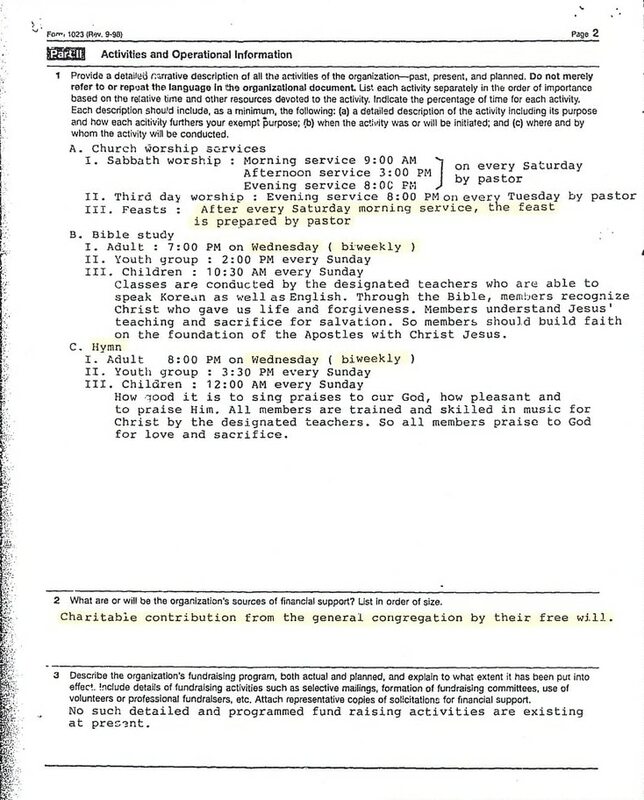 Earlier on Page 2 of the application, the WMSCOG claimed that the Bible studies were held biweekly. Here we see that Bible studies were held four times per week. 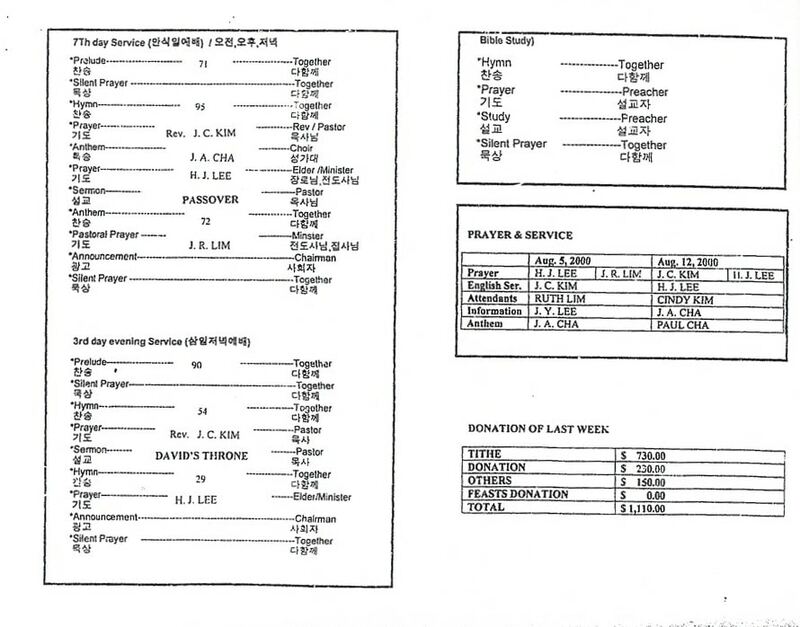 The bulletin states that the English service will be conducted by Joo Cheol Kim. When I met Joo Cheol Kim about 2 years ago he did not speak English. Donations collected for the week are disclosed as $1,110. 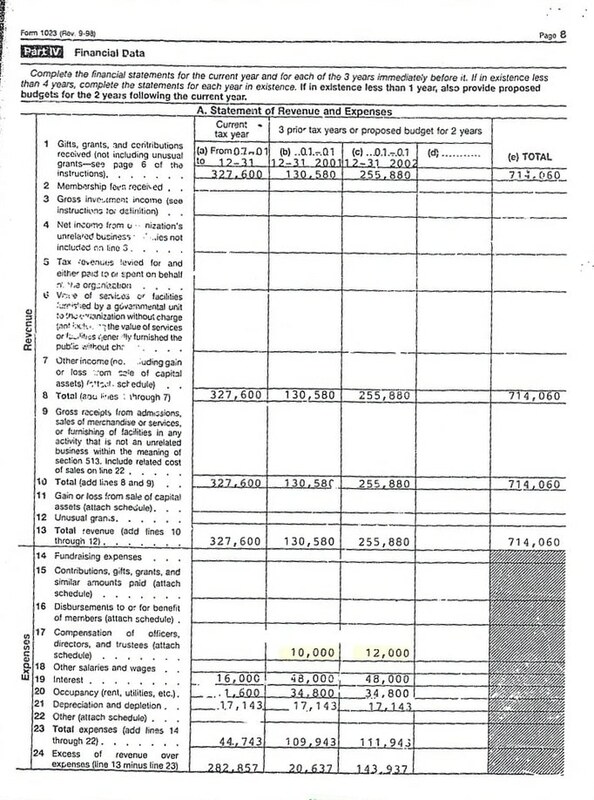 Earlier on Page 8 of the application, the WMSCOG claimed to have collected $327,600 in revenue from 7/1/2000-12/31/2000. That is half of a year. Let’s do the math. If the WMSCOG collects an average of $1100 dollars per week multiplied by 26 weeks (half of a year) that is only $28,600. Where did the other $299,000 come from? Does the WMSCOG have another source of income? Or is the amount of money reported in the bulletin less than the actual amount collected? Or was $1,110 a bad week for the collection? The WMSCOG attached a copy of their Bylaws to the application submitted to the IRS. Interestingly, there were no bylaws submitted with the application filed for the Los Angeles location a year earlier. Boast About Ahnsahnghong and ZhangGilJah to the Whole World, Except to the IRS? Since Joo Cheol Kim signed off on this application (see page 1), apparently this teaching does not apply to this tax-exempt application. 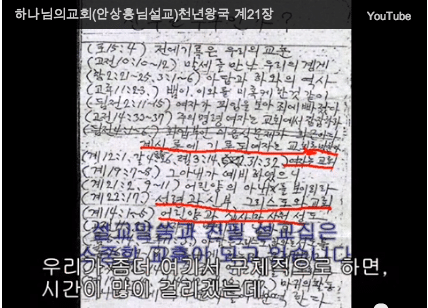 Does Joo Cheol Kim not “know the true value” of his “gods”? Section 5. Types of Membership and Admission – The WMSCOG claims to have two types of membership; An Active member who “agrees to the purpose of the Church and joins it” and an Honorary member who “made a special contribution to the Church or one with knowledge and experience as recommended by the society”. What kind of “special contribution” warrants an honorary membership to the WMSCOG? How much does one need to pay for a ticket to heaven? How much does one need to pay not to have to observe the sabbath or any of the other feasts? What kind of “knowledge and experience” would one need to earn an honorary membership? What does Joo Cheol Kim say about this in chapter 2 “Faith With Knowledge and Faith With Deeds” of his book titled “Boast About God”? 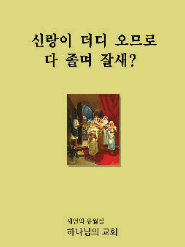 According to Joo Cheol Kim knowledge is not enough to be saved. This completely contradicts the requirements of the WMSCOG’s “Honorary Membership” described in their 1023 Bylaws. Does the honorary member obtain salvation despite not having to observe the sabbath or any of the other feasts? What does the WMSCOG consider to be “Membership Dues”? Is this another term for the member’s “tithe”? There appears to be a requirement for monetary contributions in order to remain a member of the WMSCOG. From this, one can only conclude that salvation is not free in the WMSCOG. The WMSCOG also includes a no refund policy as part of their Bylaws. Under Section 7 among the criteria that the WMSCOG lists for withdrawal of membership is “the member died”. I have personally heard WMSCOG members claim that “none of the members have or ever will die”. This statement would only be true based on the technicality that once the member is dead, he or she is no longer a member. The other reason for withdrawal that should be pointed out is “the member failed to pay dues longer than a year for no special reason”. 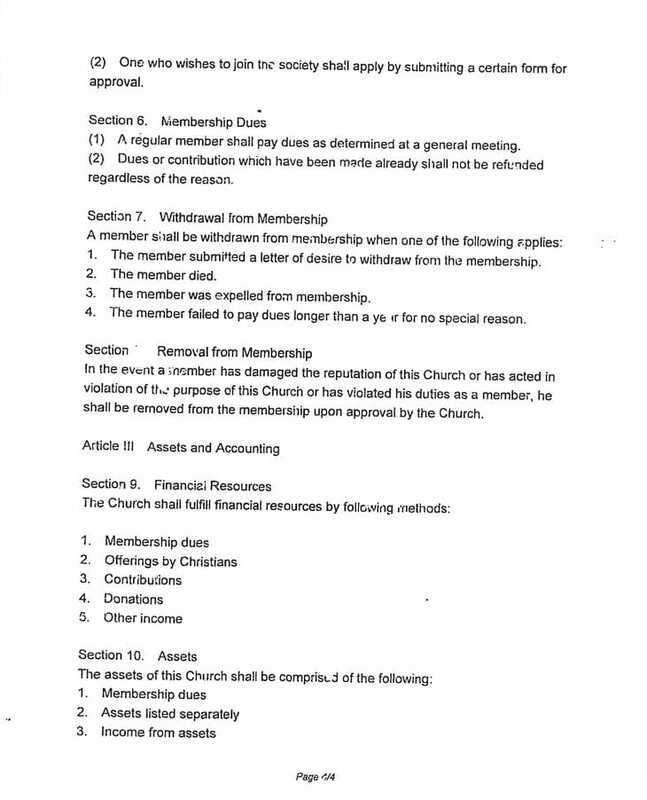 Here the WMSCOG admits that they will kick members out of their church for non-payment. It is doubtful that most WMSCOG members are aware of this. [Click here to read a former member’s account where the WMSCOG kicked him out for inability to financially contribute]. Is the member removed even if the statement(s) allegedly made to “damage the reputation” of the church are true? There are no guidelines as to how this situation will be handled in terms of an investigation of the statements made or who within the church will give their “approval” to have the member removed. [Click here to read a former member’s account where the WMSCOG kicked her out for making true statements about her experience and then tried to get her to sign a non-disclosure agreement to stop her from telling her story]. What is a “special account”? What type of money is put here? 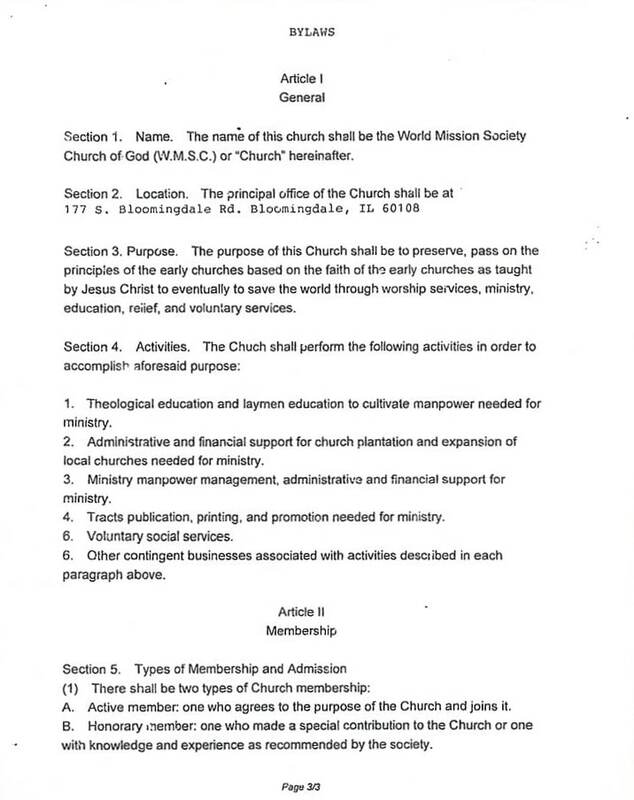 The bylaws are dated October 25, 1997 but the WMSCOG did not file for tax exempt status until 2000. I wonder if the members were aware that their donations or “membership dues” during those three years did not qualify as tax deductable donations. The application filed by the WMSCOG in Bloomingdale, IL seems consistent with the application filed in Los Angeles, CA in that it maintains the discrepancy between what the WMSCOG discloses to its members about their finances and what is disclosed to the IRS. There is great confusion over whether or not the pastors or other high ranking members are paid a salary by the WMSCOG. Current members should consider this very carefully. Either they are paid a salary or they are not. It can not be both. Why then would you give 10% or more of your income, just to remain a member of this organization? What are they really giving you in return? Are you paying for your salvation? The WMSCOG admits that they will disfellowship a member for non-payment. Where is that in the Bible? The WMSCOG says that one cannot receive salvation without believing in Ahnsahnghong and ZhangGilJah, in addition to many other requirements, but when it comes to speaking with the IRS, they only talk about Jesus. And what about honorary memberships? If you are in Bloomingdale, apparently you can pay for your salvation without having to observe the Sabbath and other feasts? As a member, how could you ignore these tremendous discrepancies between what the WMSCOG says to the IRS, and what they say to you? Joo Cheol Kim urges that members “confidently” (Boast About God, p. 58) proclaim their beliefs about Ahnsahnghong and ZhangGilJah in an attempt to “save all human beings…telling them how to receive salvation” (Boast About God, p. 38) but fails to attempt to save the IRS. Why would the WMSCOG omit their beliefs in Ahnsahnghong and ZhangGilJah here? What would the WMSCOG say to a member if the member failed to disclose their belief in Ahnsahnghong and ZhangGilJah and instead only spoke about Jesus Christ? I wonder if the member would be rebuked for this? Next, we will examine the application for tax exempt status that the WMSCOG in Ridgewood, New Jersey submitted to the IRS in 2008. Click here to download the complete copy of the 1023 Application filed by the WMSCOG Bloomingdale, IL described in this article.